UofL offers opportunities for students to learn about sustainability from a variety of perspectives. The University of Louisville offers hundreds of sustainability-focused and related courses across all disciplines! We are also thrilled to announce that UofL students can now Major in Sustainability and pursue an interdisciplinary Master's degree in Sustainability. Students in every field have a variety of options for studying sustainability, as highlighted below. 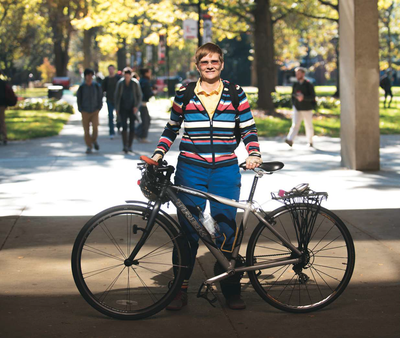 Major in Sustainability at UofL! In Fall 2017, UofL launched a new interdisciplinary Bachelor of Arts in Sustainability program! It is the first undergraduate degree housed in the Department of Urban and Public Affairs. The B.A. in Sustainability is an interdisciplinary degree program within the College of Arts and Sciences that examines interrelated environmental, political, economic, and social issues and problems facing our society at local, regional, and global scales. The goal of the degree is to prepare students to engage with these issues on multiple levels in the workplace and in their community so that collaborative solutions can be found. The curriculum is designed to educate, train and prepare students for future careers in sustainability‐related endeavors that include: the environment, energy, climate change, public policy, transportation, and urban and regional planning. This degree will also serve as a well‐rounded base to allow students to pursue graduate training in affiliated fields of study. B.A. in Sustainability graduates will be able to successfully work in government, private, and non‐profit sectors. 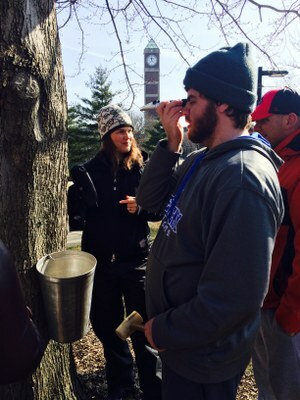 In the future, program graduates will be creators, developers, implementers of thoughtful policies that ensure sustainable economies and environmental quality in the state of Kentucky, the nation, and the world. - Develop skills that will facilitate creative, innovative, and workable solutions to sustainability problems. Full details about UofL's new B.A. in Sustainability here. Sustainability Living-Learning Community - This community provides students interested in sustainability and sustainable living with the opportunity to deepen their understanding of the principles and practice of sustainability, while developing skills, leadership, and a community of support. Participants in this immersive LLC will live together, take classes together, and take action together. They will participate in campus sustainability programming and service projects. As sustainability is an inherently transdisciplinary pursuit, participants from any major are welcome. You do not have to be pursuing a degree in Sustainability to live in this community, but participants will be exposed to this new major as an option. Full details and application here. Through the Liberal Studies Program, undergraduates interested in crafting a coherent, interdisciplinary course of study can major in topics such as these past examples: Environmental Studies and Activism, Green Studies and Earth Ethics, Eco Literacy and Sustainability, Environmental Change, Peace Studies, Pre-Environmental Law, and many more. The Social Change Minor is a great complement to any major for UofL students interested in gaining valuable experience for careers in social movements or for a lifetime of engaged citizenship. Core and elective courses help students to pursue their particular interests—for example, the environment, civil rights, politics, deindustrialization, labor, or war & peace—from a variety of disciplinary perspectives. Access UofL's diverse array of Sustainability Research & Academic Centers here. Since Fall 2015, UofL has offered graduate students from all backgrounds a unique opportunity to study the full range of issues in sustainability through a new Masters in Sustainability degree program housed in the School of Interdisciplinary and Graduate Studies. The official degree designation is a Master of (Arts or Sciences) in Interdisciplinary Studies: Concentration in Sustainability. The Sustainability Council crafted this new program with the participation of the following departments and university units: College of Arts and Sciences (Departments of Anthropology, Biology, Communication, Fine Arts, Geography and Geosciences, History, Sociology, Urban and Public Affairs), Brandeis School of Law, Public Health and Information Sciences, and Speed School of Engineering. The goal is to prepare students to address complex regional, state, national and global challenges posed by the intersection of human exponential growth and increasingly limited resources that support society. a) to promote student understanding of sustainability principles and how they connect social, environmental, and economic issues. b) to promote student ability to explain how natural, economic and social systems interact to further or impede sustainable societies. c) to provide relevant analytical tools so students can evaluate how local to global policies interact across spatial and temporal scales to affect built, natural and social environments. d) to develop interdisciplinary thinking and skills in students in the field of sustainability such that they can identify emerging areas of need and formulate research questions that bridge at least two disciplines across the built, natural and social environments. e) to train students to conduct research or engage in creative activities on sustainability through use of appropriate qualitative and quantitative methods. f) to train students so that they can work in groups and demonstrate skills for consensus building on sustainability issues among stakeholders. All students in this program are required to complete 33 credit hours of courses and must produce a thesis or portfolio (determined by student's committee). All students are required to take SUST 600 Introduction to Sustainability, and at least one course from each of three Core Areas: 1. Built Environment, 2. Natural Environment, and 3. Social Environment. Full details and application here. Below are just a sampling of the many sustainability-related courses taught at UofL across all disciplines! Explore all of the offerings in sustainability with UofL's Course Schedule, which now includes a filter option for sustainability courses. Our most recent inventory of sustainability courses offered at UofL is available here: UofL Sustainability Courses 2013-2015. Experience life in Prague and Vienna, rated as top 20 sustainable cities in the world by Arcadis in 2017. This is an elective for the Bachelor's or Master's of Sustainability (SUST), or Master's of Urban Planning (PLAN), Master of Public Administration (PADM), and Master of Urban and Public Affairs (MUP). Cost: $5308 with first payment (if doing pay plan first payment by 5/7) includes all air, lodging, ground transport, all breakfast, three dinners, guides, business trips, and some admission. To learn more, contact Dr. Sluss at Tamara.sluss@louisville.edu or 502-852-4040. This combination seminar and field-course explores the interconnections between global level dynamics of displacement and dispossession (on the one hand) and local level transformations and contestations over urban resources and regimes of belonging (on the other). In the seminar component of the course, we will discuss historical and contemporary accounts from cities worldwide. The field-course component will be comprised of weekly field-trips and community interactions here in Louisville that will enable us to explore the local-level implications of the concepts and dynamics about which we read. The course challenges presumptions about American exceptionalism (particularly in its property-centeredness) while also emphasizing the historical and contextual specificity of human migration, urban transformation, contestation, and regimes of dis/possession. This course explores the political, economic, cultural dimensions of hunger, food security, and food justice globally and locally. The concept of food justice has been deployed to capture consumption-based inequalities in access to tasty and nutritious food. The course considers not only justice in terms of dietary and culinary consumption but also such matters as land rights, intellectual patrimonies, migrant farm labor, restaurant working conditions, the concentration of grocery chains, food regulation, international trade rules related to agricultural commodities, and the environmental impacts of farming. The course concludes with a look at transnational efforts to build more just and sustainable food systems. This dynamic, community-engaged course investigates the intersection of artistic and psychosocial practices that support health and social justice efforts. Students will meet each week at the Nia Center and harness the laboratory of creative expression to examine inequity, trauma, critical consciousness, and community-led paths to increased justice and well-being. Prerequisite: SUST 101. This course will examine sustainability through a behavioral lens, exploring the psychological processes, primary research methods, and behavioral solutions involved in environmentally responsible behavior and sustainability. Students will be introduced to key principles of motivation, perception, and decision making to identify fundamental behavioral obstacles to sustainability. Prerequisite: SUST 101 and 200-level course. The course will explore the issues of sustainability from the perspective of the built environment, our history of construction and expansion, and buildings and how they interact with the natural environment. These issues will be explored from building specific, as well as urban system, perspectives including urban design. Further, the course will focus on identifying and implementing practices that lead to more sustainable man-made modifications of natural environment for human purposes. The course will comprise of a discussion about sustainable sources for energy, water, air, materials for human habitat design and management. Prerequisite: SUST 101 and at least one 200-level Sustainability course. The course will deal with policy making and governance, and explore the impacts of political economy on overall sustainability. Students will examine desired economic conditions, policies, and governance systems that may encourage adoption of best practices in sustainability, including city / county level policy making, state and federal level issues (e.g., EPA, renewable energy incentives), and grassroots political organizing. UPA 651 Historic Preservation and Sustainability: Build an Affordable House From Start to Finish! This class will meet every other Saturday for eight sessions in partnership with Habitat for Humanity. Class also includes case studies of historic preservation and sustainability with walking tours in Old Louisville, Highlands, Butchertown, Russell, California and a day long field trip to Over the Rhine, Columbia, and Covington neighborhoods in Cincinatti. Students will also read four classic books and do a research paper. Students will learn how to analyze, cost estimate, locate, repair, and purchase a historic property. You will meet three graduates of our program who have had a successful business to build and renovate hundreds of houses in historic neighborhoods along with creating Airbnb and bed and breakfast establishments. Historic preservation is an art and science; it is also fulfilling to mind and soul: students will be able to include in your portfolio and resume these activities: before and after photos of you with a hammer before and after the house is built along with a Certificate of completion from the good folks at Habitat for Humanity. The course is designed to address the institutions and governance in sustainable development, and will take an interdisclipinary approach. The course will be open to all graduate students in any program at UofL. Note: Cross-listed with PADM 670 and PLAN 670. This course introduces students to the theory, principles, and practices of sustainability from multiple disciplines, in preparation for the program. This course also helps students identify the main problems or questions that will drive their careers, explore concentrations in the natural environment, built environment, and social environment, and identify potential mentors in each of these areas. Prerequisite: SUST 101. This course introduces students to major environmental problems in sustainability. Students will examine the biophysical or ecological properties, manifestations, and consequences of these problems at local, regional, and global scales. The course will take particular interest in human-environment interactions, understanding the role different ecosystems and environmental processes play in human well-being, as well as how humans interact with and influence biodiversity, structure, and function of natural systems worldwide. The course is designed to address the social and ecological frameworks for understanding and applying sustainability concepts in both theory and practice. The course will be open to students in any program at UofL. Introduces students to the history of modern American social movements. Topics will include organizing strategies, motivations, tactics, and results. This course will cover the history of the US peace movement as well as the use of nonviolent direct action methods by other social movements. This course aims to give students an introduction to urban agriculture and urban planning/design practices and techniques in the context of food production, community development and possible economic development for a healthy and sustainable city. Students will learn basic techniques in gardening/horticulture and urban planning/community development. A great deal of time in this course will be spent outside the classroom taking tours of many different urban agriculture spaces and also working in UofL's Urban & Public Affairs Horticulture Zone learning gardening techniques. For more information contact Yani.vozos@louisville.edu or 852-8002. This online course combines readings, podcasts, and videos in and about classical and contemporary sustainability theories with hands-on practice in sustainability research and manufacture. Students will focus course projects toward their individual interests, while learning about the foundations of sustainability theory and methods for applying it to design, agriculture, management, construction, systems, development, and other areas. The coursework includes readings by an international cast of authors from many disciplines, all of which will have something to add to a definition of sustainability that each student will create and support. Students will create short videos, participate in weekly discussion board activity, and discover, through research, interdisciplinary thinking, and sustainable action, the value of sustainability for their own lives and communities. This course will link social justice and criminology while considering the causes of harm. Assumptions about crime and justice will be examined by comparing and contrasting retributive and restorative justice paradigms. Students will be asked to think critically about our current justice system as well as a social justice response to crime and harm. Open to both undergraduate and graduate students. This class will focus on environmental action and how our understanding of the science of human behavior can contribute to sustainability. It is well established that human behavior underlies almost all environmental problems. Most people report that they want to live in a way that treats the ecosystem within which we live with care and respect, yet engage in daily behaviors that have negative environmental impacts. In this class we will address why it is so difficult for us to change our behaviors and act upon our environmental concerns. There are many reasons for this, but one major idea that is gaining traction is that we are becoming increasingly dissociated or disconnected from our surroundings and the natural world. We will discuss various approaches to behavior change, within the context of a central organizational perspective of mindfulness, a meditation-based approach emphasizing cultivating attention in everyday life. We will experience and explore the practice of mindfulness and learn about how it can support more sustainable personal behaviors, in large measure by helping us pay more attention to our surroundings, and be less dissociated from them. We will explore ways to apply environmental psychology paradigms and theories to community behavioral change with a particular focus on public awareness and other methods to develop behavior change proposals for the university community. A portion of the work in this course will be done in a collaborative manner. How do we change the world? Over 100 years ago, Henry David Thoreau answered this question by suggesting Americans should vote with their whole ballot. This means utilizing the better part of politics – the aspect that could change the world in the face of impossible obstacles through all those activities outside the realm of voting called activism. This online course examines activism through the concrete tactics of activists in groups and social movements within and outside of the US. The class will draw on readings, videos, and other materials to empower students to change the world. A seminar in psychology that requires Instructor Permission, but is open to all - simply email a request to maleon04@louisville.edu. This course is intended to expose students to the theories (e.g., contact hypothesis, intergroup contact theory, social identity theory) and basic psychosocial elements of peacebuilding (e.g., trust, forgiveness, guilt, tolerance, empathy, anxiety, and depression) as they relate to interethnic relations around the world. Empirical readings and discussion will include an overview of the following: culture, race, ethnicity, identity, prejudice, discrimination, assimilation, acculturation, intergroup conflict, group responses / action tendencies toward interethnic / intergroup contact, and restorative practices in a multicultural world. The overall goal of this course is to provide students with a better understanding of the basic concepts of interethnic relations, restorative practices, and peacebuilding from both an American and global perspective, while delineating the contemporary psychosocial theories and empirical research related to this multidisciplinary field of study. Unlike most psychology courses which generally focus primarily on building knowledge and skills, this course is also designed to increase self-awareness and facilitate system-level change in regard to interethnic relations. Students will be required to complete a project for presentation on Peace Day in September and a final group project. This new online course combines readings, podcasts, and videos in and about classical and contemporary sustainability theories with hands-on practice in sustainability research and manufacture. Students will focus course projects toward their individual interests, while learning about the foundations of sustainability theory and methods for applying it to design, agriculture, management, construction, systems, development, and other areas. The coursework includes readings by an international cast of authors from many disciplines, all of which will have something to add to a definition of sustainability that each student will create and support. Students will create short videos, participate in weekly discussion board activity, and discover, through research, interdisciplinary thinking, and sustainable action, the value of sustainability for their own lives and communities. Why does San Francisco the most “liberal city” in the nation have so much success in terms of economic prosperity, clean air, water and soil, affordable housing, green transportation, historic preservation, sustainability, homeless policy, public art, architecture, and gay rights? Why does everyone want to live in San Francisco? Why San Francisco is considered one of the greatest cities on earth? What can we learn about the dos and don’ts of the nation’s most liberal city? This class will help provide students “policy solutions” that cities like Louisville could enact to fight poverty, pollution, racial division and crime. Students will get to meet the leading thinkers and elected officials of this beautiful and joyous city who have enacted policies that create healthy, safe, affordable, just and sustainable policy. What is the secret sauce that makes San Francisco great? We will have six classroom sessions to discuss the books and research assignments before we leave (May 9-19) and we will stay in San Francisco May 20-27; our hotel/hostel is in the heart of San Francisco Union Square near cable cars, subway system, rail cars and ferries. There are no prerequisites for this new course designed as an interdisciplinary survey of critical issues in sustainability studies. The primary goal is to equip students with the tools necessary to engage in critical assessments of sustainability as both a theory and as a practice. Does a policy which claims to be sustainable, actually increase sustainability, or does it, for example, merely “move the problem around geographically?” However, the ability to critique sustainability does not necessarily mean an ability to effectively wield sustainability for particular outcomes. This is the paradox between theory and practice. Thus, the secondary goal of the course is to enable students the ability to make use of sustainability as an approach to problem-solving. View the course syllabus here. Students will learn and practice ways to eat, move, and sleep to support wellbeing and resilience from specialists in the Office of Health Promotion: Karen Newton, MPH, RD and Katrina Kaufman, MEd, CHES. Discover how small choices really do lead to big changes. The course will be instructed through the concepts and theories presented in the required text: Tom Rath's Eat, Move, Sleep. An examination of the moral status of the natural environment and ethical problems of human/environment interaction, including Environmental Justice and Global Climate Change. All too often, decision makers target growth, mostly measured by economic indicators, as the cure-all solution to a myriad of conflicts that exist in society. However, studies have shown that growth without consideration of the environment or social equity only leads to recurring crises. This course considers environmental, social, and economic challenges that we face from a different angle: How can we meet the needs of the present without compromising the ability of future generations to meet their own needs? The goal of this course is to foster systems thinking and take a holistic approach in exploring theoretical and practical issues related to environmental, social, and economic sustainability. A major focus of the course is on ethnographic case studies on sustainability around the world. SUST 600 is a core requirement for UofL's new Sustainability Masters Degree Program in the School of Interdisciplinary & Graduate Studies. In preparation for the program, this course introduces students to the theory, principles, and practices of sustainability from multiple disciplines. The course will also help students identify the main problems or questions that will drive their careers, identify concentrations in the natural environment, built environment, and social environment, and find mentors that will guide their career development. The goal of sustainability is to ensure the greatest quality of life for all of humankind, now and into the future (Bruntland Commission 1987). In order to achieve this goal, society must rethink its approach to development and understand how to pursue its ambitions in ways that do not jeopardize the environment or our ability to solve important social, political, and economic problems in a fair and socially sustainable manner (IUCN 1980). This requires an understanding of diverse social, natural, and built dimensions of society, and their connections; it also requires expertise in approaching problems from multiple perspectives and in collaboration from experts from many different backgrounds. This course prepares students to address complex regional, state, national, and global challenges in the domain of environmental sustainability; provides vital exposure to the range of problems in sustainability; and facilitates multidisciplinary collaboration, laying the foundation for successful transition into leadership roles in sustainability. In this course we will explore human causes of global-scale changes in climate, air and water resources, and biodiversity, and their impacts on people as well as approaches to address these problems that promote more sustainable and resilient societies. Humanity’s technology, economy and growing population have brought us and all other organisms to the threshold of significant planetary-wide change. People now manage many of the earth’s ecological systems, and scientists estimate that we shunt approximately 40% of all terrestrial primary production and >50% of the world’s accessible freshwater supply towards supporting our species alone! In recent decades science has made exciting progress in understanding how human activities interact with physical, geological, chemical and biological processes that regulate our planet’s environment on a global scale. We need to understand the science behind the effects we have on these interactive processes, if we expect to prevent, reduce or manage their unintended negative consequences. In this course you will learn more about how people are changing atmospheric chemical composition, land use (agricultural, urban), and “homogenization” of the world’s species and the effects these changes are having on global climate, major elemental cycles, ecosystem functions, biological diversity, and human disease. In addition, you will learn how decisions made by individuals, governments, businesses and other social institutions cause and respond to these rapid environmental changes from local to global scales and how we can make different choices that reduce the negative impacts of our collective behavior on nature and ourselves. This interdisciplinary seminar focuses on an alternative method of planning -- adaptive planning -- that is more flexible, iterative, and decentralized than the typical up-front development of a static, comprehensive plan that could fail if conditions change or communities experience unexpected disturbances. Cities and communities need adaptive planning in order to improve their resilience to a variety of stressors, including extreme weather, flood, drought, economic shocks, unexpected population shifts, heat island effects, stormwater runoff and pollution, and the like. This course will not meet every week. During the first 6 weeks of the semester, students will participate in online course content on adaptive planning and resilience (video lectures, guided readings, discussion threads) and ALSO meet weekly in class to discuss this cutting-edge material in substantial depth. The online lecture will include presentations by experts in the field who are engaged in adaptive planning of land, water, and other resources, from all over the U.S. Students will identify a planning issue in a community and write a paper on whether the community's planning processes are adaptive and how adaptive planning processes can be applied to the community and its issues. In order for public administrators to carry out their mission of serving the public, or community as a whole, they must have the skills to meet the diverse needs of all members of the population. Such skills are commonly referred to as cultural competency. Terry Cross defines cultural competency as, “A set of congruent behaviors, attitudes, and policies that come together in a system, agency, or among professionals and enables that system, agency, or those professionals to work effectively in cross-cultural situations. “ A culturally competent system acknowledges and incorporates at all levels – the importance of culture, the assessment of cross–cultural relations, vigilance toward the dynamics that result from cultural differences, the expansion of cultural knowledge, and the adaption of services to meet culturally-unique needs. In this course, we will: Review relevant literature relating to cultural competency; Analyze agencies commitment to cultural competency; and Develop cultural competency policy solutions. Please email Dr. Aaron C. Rollins <aaron.rollins@louisville.edu> with any questions regarding the course. Human activities profoundly alter distributions of organisms and ecological functions of natural systems, but in few places do they modify the earth's surface more directly and substantially than in cities. Landscape alteration associated with urbanization not only affect human quality of life, but also offers ecologists new arenas for addressing both basic ecological questions and issues of urgent environmental concern. These include predicting evolutionary, population, community and ecosystem responses to many global environmental change factors like habitat fragmentation, invasive species introductions, and air and water pollution. Urban expansion can provide a mosaic of new combinations of resources, conditions and species for examining the roles of direct and indirect interactions, threshold effects, feedback loops, habitat isolation, and disturbance, in stabilizing or changing the ecological systems that comprise urban green infrastructure. This course also addresses the importance of integrating the social sciences with the biophysical sciences if we are to holistically understand the functioning of cities and associated suburbs, and predict their likely responses to global environmental change. Therefore, this course will also deal with the topics of urban resilience, adaptation and sustainability. This graduate seminar will provide an overview of U.S. environmental history from both policy and movement perspectives. While our initial focus will be U.S. based, we will also examine the global picture when we delve into climate change. We will address key areas of environmental sustainability and the emergent solutions to the “Wicked Problems” associated with improving and saving our environment. We will do this from an interdisciplinary perspective with an emphasis on a variety sociological approaches to examining our world. Students are expected to have a basic understanding of social science research methods and theory and will be encouraged to bring other approaches to the seminar. An interdisciplinary outdoor environmental education Honors Seminar in Social Sciences designed to get students directly involved in local watersheds through paddle trips on urban waterways and discussion of water quality and habitat issues associated with urban environments. A comprehensive overview of the city by looking closely at Louisville's political, planning and policy outcomes of decision making. We will spend time touring the city (walking, biking and bus) and learning about struggling and prosperous neighborhoods. No prerequisites. Open to all graduate students and advanced undergraduates by permission of instructor. This course will explore the relationship of urban planning, ideas of sustainability, and issues in natural hazards and disasters. The role of urban planning and development has a tremendous impact on community preparedness and resilience, and further on sustainability of communities long term. A graduate level introductory approach to basic planning practices, as well as an overview of sustainability thinking and approaches. These concepts are then examined as they apply to natural hazards and disasters, looking at events such as Hurricanes Katrina & Sandy. These events (sea rise, flooding, typhoons, severe storms, tornadoes, etc.) are predicted to be on the rise in frequency and intensity as a result of climate changes. What are the key economic, social and political implications of where these ideas intersect? What are appropriate strategies at local, regional and national levels? What are the barriers and incentives to improve community sustainability and resiliency? No prerequisites. Open to all graduate students & advanced undergraduates by instructor's permission. This course explores the intersection of anthropology and environmental public health. With a focus on the pollution-health-culture relationship, we examine the place of environmental contamination in contemporary medical anthropology, the growing interest in the political ecology of health, the critical role of health in environmental justice struggles, as well as the importance of social structure and environmentally mediated political economy on health. The anchoring questions of the course include the following: Why is there so much controversy over the connection between pollution and disease? What are the implications of disagreements between lay publics living with pollution and public health experts investigating environmental health risk? Who defines which diseases are most important and which toxic substances get addressed? How is environmental illness politicized? What are the social, political, and scientific dimensions of contemporary environmental health movements? The best laid plans for environmental sustainability often fail when planners and administrators do not account for the human dimension of the problem. Recycling bins are great, if people are sufficiently motivated to use them, and a comprehensive mass transit system could greatly boost air quality in the city, if decision makers in state and local government could be persuaded to fund such a progressive undertaking. In this course, students will be introduced to fundamental principles of human behavior needed to address these and other common behavioral obstacles faced during the design and implementation of urban environmental solutions. Students will also work closely with members of the community (e.g., Partnership for a Green City) to develop a behaviorally-informed solution to an important local urban social-environmental problem. This course blends learning and doing. We will study selected forms of Applied Theatre that have been and continue to engage theatre makers and audiences in fostering social justice. These include, Theatre For Development (often used in the developing world), Theatre in Education (an English term for theatre schools and community centers often including teaching and social workers), and Augusto Boal’s Theatre of the Oppressed, (which strives to help people understand their own agency to empower them to act against forms of oppression they experience). All of these use theatre as a social tool rather than an autonomous result. We will also study some playmaking techniques such as story circles, writing haiku, conducting interviews, and Augusto Boal’s theatre of images. Students will eventually divide into ensembles that use applied theatre to address issues of their choosing, which will be performed for the department. Since its inception, anthropology has broadly dealt with “ecological” questions, including human perceptions of the natural world and the relationship between “nature” and “culture,” as well as the ways human populations use culture as an adaptive mechanism to their habitats and ecosystems. More recently, “environmental anthropology” has grown as a specialization within anthropology, focusing broadly on the study of environmental conflicts and politics from an anthropological perspective. This course provides an introduction to environmental anthropology and explores real world concerns such as socio-natural disasters, climate change, biodiversity conservation, industrial hazards and pollution politics, environmental justice, natural resource conflicts, and the environmental costs of development and consumerism. We focus on environmental issues historically and cross-culturally, but with a primary focus on contemporary globalization and enduring structures of power. This course explores contemporary global environmental debates from a political ecology perspective. A strong focus within environmental anthropology today, political ecology has both drawn critical attention to the politics of natural resource use and control and informed our understanding of ecopolitical debates provoked by environmental change and plunder. We engage tough questions: what is the social and political constitution of environmental science and expertise; how do environmental science and technology shape social-environmental relations, and conversely how do social-environmental relations shape science and technology. The course draws on perspectives from the humanities, social sciences, and natural sciences to critically explore and discuss, among other concepts and topics, environmental knowledge production, neoliberal ecopolitics, sustainability, ecological modernization, risk society, ecosocialism, climate change, environmental justice, environmentality, and the complex and variegated ways in which these and other topics and concepts enliven the contemporary field of political ecology. Study of environmental and resource issues on the global level, focusing on the various implications of sustainable development. A global environmental politics class with an emphasis on climate change and resource scarcity. See Professor Payne's blog about this term’s textbooks here. Think of this as a course in "analyzing urban social-ecological systems" in order to develop tailored solutions for the specific social/environmental problems plaguing different urban environments. The unique social, political, economic, and biophysical factors inherent in different urban environments (e.g., Louisville versus New York) influence human behavior in important ways that need to be considered when designing effective solutions for environmental sustainability. In this course, students will learn how to identify, describe, and address these social-ecological differences using Nobelist Elinor Ostrom’s Institutional Analysis and Development Framework. Students will also have the opportunity to work with members of the community (e.g., UofL’s Sustainability Council) to apply this framework to help develop a solution to an important local problem. See a sampling of some of the Sustainability Courses offered at UofL in 2012. See a sampling of some of the Sustainability Courses offered at UofL in 2011. SOC315 Environmental Sociology - Problem identification, policy formulation, and agenda implementation examined from an environmental and developmental perspective. Review of institutions, processes, and social conflict. Includes a voluntary community service component.